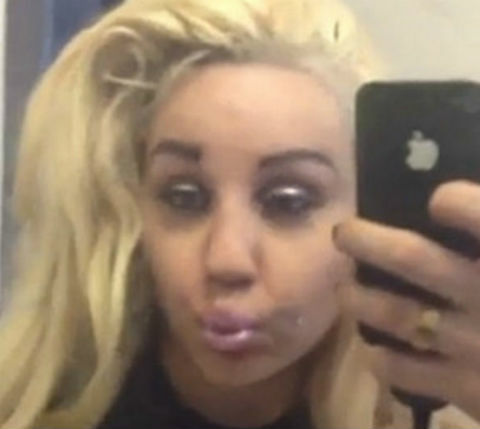 -This is probably for the best: Amanda Bynes‘ mother has been granted legal control over her daughter. -Congrats to Ashley Tisdale, who reportedly got engaged last night at the top of the Empire State Building. -This photo of an Empire Records cast reunion warms my cold, cold heart. -A sketchy report suggests Lindsay Lohan was spotted partying ’till the early hours of the morning. Does Oprah know about this? -Speaking of Opes, she says she recently got the snotty Pretty Woman treatment at pricey Swiss boutique. Big mistake. Huge. -If you ever wanted to see Jennifer Love Hewitt awkwardly work out with an exercise ball, today is your lucky day. –Bono, just say “no” to mandals. Trust. -I actually really liked the original ending to The Hills, which exposed its total lack of “reality” in the final shot. But this alternate ending is blowing my mindgrapes! –Jennifer Lawrence prepares for battle in the new international trailer for Catching Fire. -I don’t know if this security sign that’s supposedly outside Taylor Swift‘s house is the real deal, but I really hope it is. -Congrats to Vince Vaughn and his wife, who just welcomed a new son. They named him Vernon Lindsay, after the actor’s father. -The LAPD have dismissed Leah Remini‘s missing person report for the head of Scientology’s wife, with TMZ reporting that cops had a face-to-face meeting with her. Something’s still…off. -I love and adore Connie Britton and I love and adore everything she says in her new Ladies’ Home Journal cover story. I’m just not loving the styling. That doesn’t even look like her face in the first photo, and the cover shot makes her hair look terrible. How is that even possible? Connie Britton’s hair rules the world! -On the flip side, I’m loving the styling in Miley Cyrus‘ new magazine spread. If only Kiernan Shipka hadn’t already beat her to the ‘young star looking hot in fuzzy couture’ punch this month. -A sequel to Now You See Me is in the works. But I still need someone to explain away all the plot holes in the first one! –Chris Brown reportedly suffered a seizure in a recording studio early Friday morning. –Breaking Bad’s Dean Norris made a funny for FunnyorDie. -Just in case you weren’t already convinced of Anna Kendrick‘s awesomeness, here are 11 ways she’d liven up your party. -CBS is eying a Wizard of Oz-themed medical drama. In real life. –Liam Hemsworth has a “no shirtless selfies” rule for Twitter. If only his girlfriend would follow suit. -Speaking of those two, they walked a carpet together last night for the first time in over a year. Yay? –Ariana Grande is begging fans to chill out after they went cray cray because Justin Bieber was spotted kissing her on the cheek. –Werner Herzog‘s gut-punching documentary on texting while driving might be the thing that finally stops it. You can watch the whole thing here. -More evidence that Bruce Willis is a jerk: Sly Stallone would rather work with Mel Gibson than him. -The trailer for Season 3 of Homeland just dropped, and even though the show kind of lost me last year, this promo is really, really working for me. Mostly because A) it features a lot of Claire Danes Cry Face, which is the quickest thing in the world to reduce me to vapor, and B) it’s soundtracked by The Cinematic Orchestra’s “To Build a Home,” which I once listened to non-stop for an entire week.